All of our dreams came true when we had the opportunity to interview the veritable Meme Queen herself: GOON DADDY. For those who have been living under a rock, she is a 20 year-old kinda goth gal that loves reality television, high fashion, cheap wine, and dissecting the niches of Perth one meme at a time. Q- When and why did you start making your memes? I started making them around 2 months ago when me and my boyfriend broke up during exam week, and I was just hell bummed and didn’t wanna study. 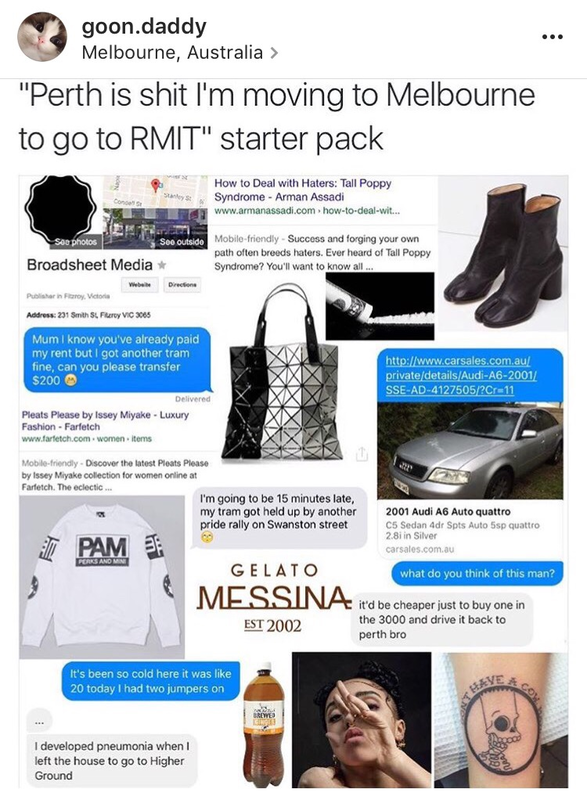 Q- Has anything cool or weird happened to you since your memes got "popular" in Perth? Nothing super weird, been getting a few messages when I’m out from people being like “hey I think I just saw you!”, which is pretty cute, but I’ve also been getting some hell audacious messages. I’ve actually made some super good friends through IG… Some people slid into my DMs and now we just share memes on FB, and stuff. Q- What was the last TV series you binge watched? Q- What were the last 5 Perth gigs you went to? I went to Oh Gosh pres. OH Grotto, but I was denied entry cos I tried to sneak in a bottle of Lil Fat Lamb >:( A few things at the Bird, too, like Hip Hop Kara”Yo!”ke, and the launch of my friend’s Zine, As If (check em’ out @asifzines ! <3). Also, Gelato My God at Chicho was pretty chill. Q- What albums are you digging right now? Freetown Sound by Blood Orange is smooth AF, but also been pumping Mariah Carey’s Emancipation of Mimi, and E•MO•TION by Carly Rae Jepsen. Anything by Mykki Blanco, Shabazz Palaces, and SOPHIE is always welcome, as well. Q- Whats your favourite place to eat in Perth and why? Honestly, I think about Chicho Gelato a lot, but Late Night Valentine does the fucken best fried chicken burger. Tan Po Po and Mr Munchies are classics for Japanese, tho, and Clarence’s used to do a parmi and pint deal that I really miss (if ya reading this, bring it back!!!!!). Q- What are you currently studying at uni? Fine Art and Marketing at UWA. Q- Do you have any other creative aspirations? My friend, Eloise, and I are really keen to start our own fashion business and open a store. Q- Have any of your memes made fun of yourself? They have!! I did one that was literally just dragging me, it was pretty personalised, but some of the others definitely do it to a certain degree, as well. Q- Favourite store in Perth? Q- Will you make an Isolated Nation starter pack? Too see more- Check out her insta here.